Jio is back with another bang offer for its users. If you're a prime customer of Jio then Recharge with Rs.398 or above till 31st January, 2018. You will get vouchers benefits in total of Rs.700. 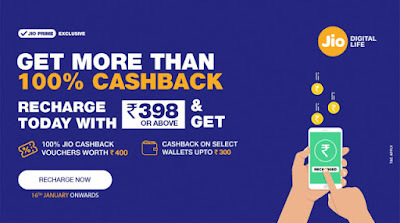 Jio Vouchers of Rs 400 and Wallet cashback offers of upto Rs 300. Please read the below offers and terms carefully. 100% Cashback of Rs.400 (50×8 Voucher) on next recharges. • If you already have existing plan then also you can recharge and once your old plan is over the new plan will be activated automatically. • Once recharge is done, you will get the benefits of partner vouchers from Jio.